I watched this movie as a kid on TV back in the day – possibly 1981 or 1982 and freakin’ loved it. 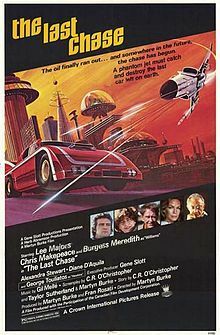 I mean, come on: it starred Lee Majors (you know, the Six Million Dollar Man – just the coolest guy ever), and Chris Makepeace (the then up and coming Canadian actor and co-star of the awesome Bill Murray film, Meatballs), and they were driving a freakin’ race car across a post plague stricken United States while the governed send out Burgess Meredith in a 1950s era F-86 Sabre fighter jet to kill him. Lee Major’s plays an ex racecar driver, Franklyn Hart who has had trouble fitting into the new post plague U.S. with it’s overbearing governement and new no cars policy. In an effort to fight back, he plans on driving himself in his Porsche race car across the States to Free California. Before he has a chance, he’s joined by genius mis-fit Chris Makepeace, who has been hacking government computers, and being a jerk. He forces himself along for the ride (of course) and along the way, the two become friends. The Government wants to do anything they can to prevent Hart from reaching California and possible becoming a folk hero, and bring Air Force pilot Captain J.G. Williams (Burgess Meredith) out of retirement and plop him into an out dated jet with instructions to stop Hart. One problem: Williams is more into this for the fun, and actually sympathizes with Hart. Despite a few brushes with him, Williams takes it easy on him, and eventually end up saving Hart by sacrificing himself. Ok… This movie has not aged well, and is once again proof that somethings are best left as great memories. Still, I am glad I re-watched it. Sure, it`s terrible but I had fun. I don`t think I could really recommend it, but I will anyway.